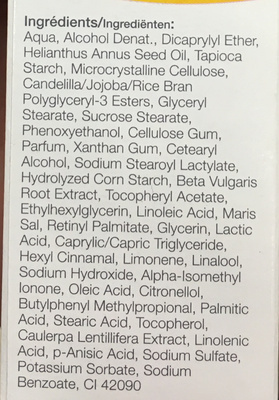 Aqua, Alcohol denat., Dicaprylyl Ether, Helianthus Annuus Seed Oil, Tapioca Starch, Microcrystalline Cellulose, Candelilla/Jojoba/Rice Bran Polyglyceryl-3 Esters, Glyceryl Stearate, Sucrose Stearate, Phenoxyethanol, Cellulose Gum, Parfum, Xanthan Gum, Cetearyl Alcohol, Sodium Stearoyl Lactylate, Hydrolyzed Corn Starch, Beta Vulgaris Root Extract, Tocopheryl Acetate, Ethylhexylglycerin, Linoleic Acid, Maris Sal, Retinyl Palmitate, Glycerin, Lactic Acid, Caprylic/Capric Triglyceride, Hexyl Cinnamal, Limonene, Linalool, Sodium Hydroxide, Alpha-Isomethyl Ionone, Oleic Acid, Citronellol, Butylphenyl Methylpropional, Palmitic Acid, Stearic Acid, Tocopherol, Caulerpa Lentillifera Extract, Linolenic Acid, p-Anisic Acid, Sodium Sulfate, Potassium Sorbate, Sodium Benzoate, CI 42090. Produit ajouté le 24 février 2016 à 14:57:11 CET par tacite. Dernière modification de la page produit le 19 mai 2016 à 21:21:32 CEST par .